The USC Thornton School of Music invites applications for two full-time positions in its Music Industry program. The celebrated program, ranked among the top in the country, currently includes 200 undergraduate majors, plus another 165 minors. This fall, it will add 25 graduate students in the inaugural class of a new master of science degree. Both positions begin in August of 2018. An ideal candidate is a senior or executive-level professional with demonstrated success as a leader in the music industry, with well-established and powerful relationships in the music business community, as well as teaching experience in the higher education, continuing education, or executive training environment. Minimum qualifications: a Bachelor’s degree, seven years of professional music industry experience, and demonstrated record of successful teaching or mentorship. Preferred qualifications: a highly recognizable personal brand and reputation within the industry, ten or more years of professional music industry experience and three or more years of university-level teaching, and an advanced graduate degree. An ideal candidate is a seasoned professional with demonstrated success as a leader in the music industry, with a solid understanding of and reputation in the music business community, as well as teaching experience in the higher education, continuing education, or executive training environment. Minimum qualifications: a Bachelor’s degree, five years of professional music industry experience, and demonstrated record of successful teaching or mentorship. Preferred qualifications: an advanced graduate degree, seven or more years of professional music industry experience and three or more years of university-level teaching. 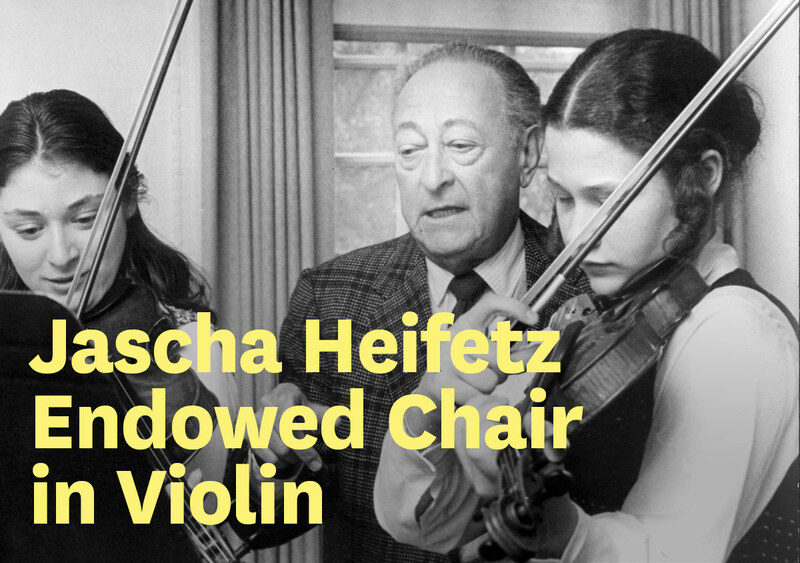 Celebrating the legendary violinist, Jascha Heifetz, who taught for many years at the USC Thornton School of Music, the strings department and its stellar faculty invites applications for the Jascha Heifetz Chair in Violin. The tenure-track appointment as Professor of Violin begins in August of 2019. Click here to apply. More administrative and teaching positions at USC Thornton can be viewed on the USC Careers website. To learn about part time Work Study job opportunities for students, click here.